Gauges the section contains data items used to calculate values displayed by gauges. Data items are arranged in containers. Each data item container can hold two data items. The first item contains actual data and the second item (optional) contains target data. If both items are provided, gauges show the difference between actual and target values. Series the section contains data items whose values are used to label gauges. All buttons for customizing are on the Design tab. 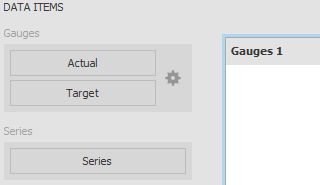 To control how gauges are arranged, use the Content Arrangement group in the Design Ribbon tab. By default, the Auto Arrange option is enabled, which automatically resizes gauges to fit within the dashboard item. You can also specify the number of columns in which gauges are arranged. Click the Arrange in Columns button and specify the appropriate number in the Count field. Similarly, you can arrange gauges in a specific number of rows. The Gauge dashboard item allows you to select the gauge type: Full Circular, Half-Circular, Left-Quarter Circular, Right-Quarter Circular, Three-Fourths Circular, Linear Horizontal and Linear Vertical. Gauges - InLoox • Copyright 1999-2019 © InLoox, Inc. All rights reserved.